To be honest, I wasn’t sure whether I would write a review of this album or not. 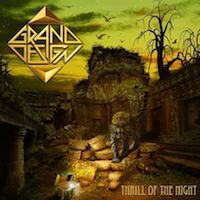 The first time I heard about Grand Design was back in 2009 when they had just released their debut album Time Elevation. I took a bit of interest because I had read that the band was heavily into the melodic hard rock from the 80’s and that they had a very special relationship with Def Leppard. Not that they were Def Leppard’s best friends or anything, but the album had a reputation for paying tribute to the Sheffield bunch. I liked that album and sure enough, the Def Leppard similarities were all over their record although not even remotely as prominent as on a Def Lep clone band like the hideous Loud Lion. Still, after playing the album a bunch of times, it soon left me a bit bored and since then, I don’t think I have even listened to it even once. That’s why its follow up, 2011’s Idolizer is an album that is still unheard to these ears. I just couldn’t be bothered. A cavalier act of mine? Well, maybe so, but it’s not intentional and sometimes records just doesn’t fall under my radar. Prior to this album, this Swedish five piece released a single and a video of a song called “Baby It’s You”, that featured a vocal duet between singer Pelle Saether and Susie Päivirinta – for us Swedes known as one half of sister pop duo Lili & Susie that had some really big success in Sweden during the 80’s. Why they decided to release that song when they did is really beyond me as the song in question really wasn’t that much to write home about and now when their new album is out, the song isn’t even included. Maybe I wasn’t alone on thinking that the song wasn’t all that… The fact that that song left me so underwhelmed didn’t exactly make me want to throw myself over the new record when it was finally out. But just like on so many other occasions, there’s that tiny little thing that you just can’t put your finger on that makes you wanna go check an album out even though you might not have given a rat about it earlier on. That’s what happened when I got turned on to bands like Nickelback and Hinder. Used to hate them and then – BOOM – something told me to check them out and hey, change of mind. So when the first single and video for the song “Rawk ‘n’ Roll Heart Attack” was out, I watched it instantly to see if my hunches were right. The song had a nice 80’s groove and was really catchy, but the whole approach felt way to cheesy for comfort. I really have no problem with cheesy music, but some songs just make crawl through my skin. I don’t think this is a bad song, but I have a real problem taking this in and I’m not sure this would have worked even in 1986. But I didn’t give in and made sure that I would at least give the album a couple of spins so I could write a fair review. Opening track “U Got Me Good” got me by the balls in an instant. Much to my surprise, what came through the headphones was 80’s melodic hard at its best. A steady groove and a chorus that will have your fists in the air whether you like it or not. “The Rush Is Gone” is a total Def Leppard rip-off, a song that goes in the vein of their “Gods Of War” / “White Lightning” / “Paper Sun” songs and usually I can’t take such obvious thefts, but in this case, I can’t help but to love this. Their love for Def Leppard shines through on many places on this album and the awesome “10 Outta 10” is no exception, however this song is an 80’s melodic hard rock tune with a Lep influence more than a rip-off. I love Def Leppard’s “Have You Ever Needed Someone So Bad”. When Leppard put that side to it, they could write the best power ballad ever. Grand Design has surely gone to Lep school because “When The Greatest Love Of All Kicks In” has graduated from there and said Lep-ballad must have been the blue print for that song. Do I care? Not one bit. I’m a sucker for a killer power ballad and this sure is one. “Rip Iddup” (nice spelling, guys) sounds like “Billy’s Got A Gun” with an 80’s Paul Stanley chorus and really, what’s not like about that? “Who’s Gonna Rawk You Tonite” is a good melodic hard rock song, but guys please, just the title of this one says it all. It’s really beyond all clichéd cheese in the world. Besides you have already spelled rock “rawk” once on this album. That’s ok but twice is overkill! They close the album with the title track and guys, that “Women” intro might just be enough for a lawsuit. But the rest of the song is a real 80’s killer that should satisfy anyone with their heart in the 80’s melodic rock scene. The constantly recurring Def Leppard influences and rip-offs might be a bit overmuch and the fact that Grand Design really doesn’t have much of a style of their own doesn’t take away the fact that they have written a whole bunch of really great songs this time and with great songs you can come a long way. Add to it that the production screams 1988 albeit bigger and fatter and you have a really good album on your hands. I would say this is a surprisingly good album. You might say what the hell you like about them showing their Def Lep influences on their sleeves, but so what? Def Leppard doesn’t exactly rush out records anymore, the last one came out six years ago so for any Lep-fan, what’s not to like about a band of really good musicians that keeps their legacy alive? Or something. Well, if you can look the other way and don’t be pretentious, then you just might find yourself having some really good 40 minutes to spend here. They certainly surprised me.